BEIJING, Dec. 29 (Xinhua) -- President Xi Jinping Friday stressed the importance of reform in 2018, when China will celebrate the 40th anniversary of launching the reform and opening-up policy. 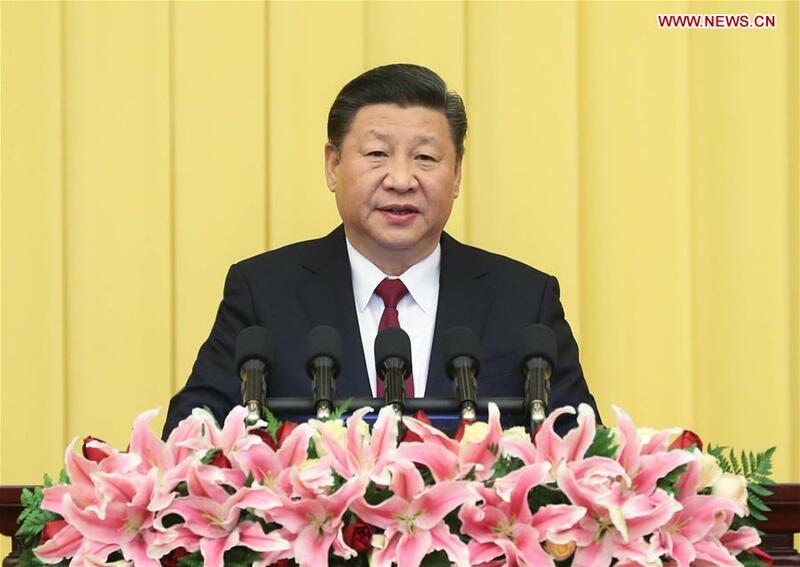 Xi, also general secretary of the Communist Party of China (CPC) Central Committee and chairman of the Central Military Commission (CMC), made the remarks while addressing a New Year gathering held by the National Committee of the Chinese People's Political Consultative Conference (CPPCC). In 2018, efforts should be made to comprehensively implement the spirit of the 19th CPC National Congress, adhere to seeking progress while maintaining stability as the underlying principle, and boost the healthy and continual development of the country's economy and society, Xi said. Xi vowed to maintain long-term prosperity and stability in Hong Kong and Macao special administrative regions in 2018. "We will continue to implement the policies of 'one country, two systems,' 'the people of Hong Kong governing Hong Kong,' 'the people of Macao governing Macao,' and a high degree of autonomy for both regions," Xi said. He pledged to adhere to the one-China principle, push forward the peaceful development of cross-Strait relations based on the 1992 Consensus, and oppose separatist activities in any form. "We will stick to peaceful development as always and build an open, inclusive, clean, and beautiful world that enjoys lasting peace, universal security, and common prosperity," Xi said. Xi also stressed the importance of developing a patriotic united front and improving the system of multi-party cooperation and political consultation under the leadership of the CPC in 2018 in order to gather consensus and realize the goals set at the 19th CPC National Congress. Looking back, Xi said that 2017 was "a landmark year in the development of the Party and the country, with remarkable achievements fulfilled in all areas of socialism with Chinese characteristics." "China has developed its diplomacy on all fronts and remained committed to building a community with a shared future for humanity," Xi said. Noting strict governance over the Party "is a journey to which there's no end," Xi said that the anti-corruption campaign had built into a crushing tide, and was being consolidated and developed in 2017. The country carried on deepening reform in all aspects in 2017, with 79 key reform tasks completed, 211 reform tasks finished by central departments and 399 reform plans put forward in various sectors, he added. On behalf of the CPC Central Committee, State Council and CMC, Xi extended New Year greetings to non-Communist parties, the All-China Federation of Industry and Commerce, personages with no party affiliation, people's organizations, as well as people from all walks of life, including workers, farmers, intellectuals, soldiers and police officers. His greetings were also extended to compatriots in Hong Kong, Macao, Taiwan and overseas Chinese, as well as international friends. Yu Zhengsheng, chairman of the National Committee of the CPPCC, presided over the gathering. Yu asked political advisory bodies to perform their functions of political consultation, democratic supervision, and participation in the deliberation and administration of state affairs. The gathering was also attended by senior leaders Li Keqiang, Zhang Dejiang, Zhang Gaoli, Li Zhanshu, Wang Yang, Wang Huning, Zhao Leji and Han Zheng, along with non-CPC members, leading officials of central departments, members of different ethnic groups and people from all walks of life. The CPPCC serves as a key mechanism for multi-party cooperation and political consultation under the leadership of the CPC, and is a major manifestation of socialist democracy.